A few weeks ago, I wrote a tutorial for quilling paper pine needles. I had been curious about how to make them for a while and I was pretty pleased with the outcome! And guessing by how many crafters have visited that post since, it seems that many others have been wondering too. This week, I’m sharing another easy way to make fir trees, but on a much smaller scale. I present to you mini quilling paper evergreen trees! You won’t need much for these trees. Just some green paper for your needles, brown for the branches and some white glue. A wax paper covered work board would be helpful later on, too. Start by making some branches. Layer two strips of brown together with glue and press the entire length together firmly so there are no air bubbles between them. The size of your strips doesn’t matter much at this point because you’ll be tearing them into bits later on. I chose Quilled Creations’ Light Brown because it contrasted nicely with my needles. As your branches dry, layer green strips (I’m using my favorite green – Lake City Crafts’ Leaf Green) in the same way and dry. Keep in mind the reason for all this layering is so your trees are nice and strong. If you’re using very thick paper or cardstock, you might not need to make stronger strips by layering. Once your paper is dry, you’re ready to start molding your evergreen needles! You could use all the pins just like the larger needles, but when working in this size, the needles just get in the way. Now we’re just using our fingers! First, grab one of your green strips and bend in half without creasing to create a small loop. This bend is going to be the first needle on your branch. It’s also where you’re going to attach a stem. Apply a dot of glue to the bottom of the loop. I found it helpful to bend the rest of the paper strip out a bit first. Add a small piece of the brown quilling strip to the glue and let dry. Once the glue has set, it’s time to start making the rest of the needles. Like I mentioned earlier in the post, we’re just using fingers for this, and we’re just making loops. … then holding that curve with one hand, let the strip loop again at the base near the stem. Keep making loops until you run out of paper. Because you’re using a thicker strip, it won’t crease or fold too much. When you’re done, the needles will look a bit like a piece of ribbon candy. Release your needles and add some glue wherever the green paper meets the stem. Reshape along the stem and let the glue dry. It might not look like much now, but just wait! Flip your branch over and loop the evergreen needles on the other side in the same way. It’s really starting to look like a branch! To finish, give your branch a good squeeze to flatten out the needles and give them a little point. You may want some of your branches to have a slight bend too. These mini evergreen branches would be perfect tucked into a winter flower scene. But if you’re looking to make an entire tree, I would make a quick triangle sketch about the size that you’d like your finished project to be. Slip this under a piece of wax paper on your work board to use as a guide. Lay out your completed branches filling in your triangle and using a dot of glue wherever your branches meet. Keep in mind, you will be building up your tree in layers, so you don’t have to completely fill every open space right away. Keep layering your evergreen branches to fill in your tree. Note: after I took the photos above I realized that I would be able to see the brown of the stems in the branches on the outside of my tree. To fix this, I added another green paper strip to make more needles on those stems. Three layers seem to be just right. You can see from this angle how I staggered the heights of the layers away from the top. This will aid in the 3D effect and leave space at the top for your tree topper. 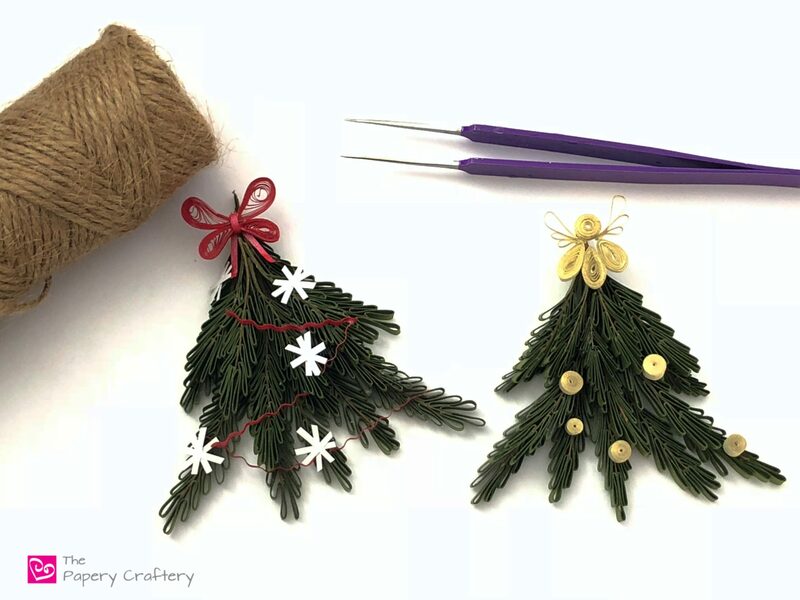 It’s time to start trimming your mini quilling paper evergreen tree! Try adding some tiny white sparkles. Or use thin 1/16″ width paper for a bow topper and some garland made with a paper crimper. I also went a little more traditional with a classic quilled angel and some golden ball ornaments! It may seem like a lot of effort, but once your fingers figure out the steps these mini quilling paper evergreen trees will come together quickly. It will take a minute or two to create each branch. And I used less than 15 for each tree. You’ll be decorating your tiny trees in no time! I think it would sweet to recreate your family tree as a gift! How would you decorate your quilled tree? Really cute trees. Loved the angel. I would use rhinestones, all one color, so the stones do not overtake the cute tree. Great idea! I love a little sparkle! I love it, Rudy June! I’m so glad you’re finding my posts useful. Love these. You are sooo talented. I am going to give these a try. Thanks for your tutorial. Thanks so much! Let me know how they turn out! Thanks for sharing gift,WOW! I like it,beautiful. I’m trying this project today. Great tree ornament to top packages. They sure would be! Enjoy and let me know how they turned out! Thank you so much. I’ve been looking everywhere for a tutorial and this is perfect! Thank you again. You’re so welcome, Pat! Enjoy!